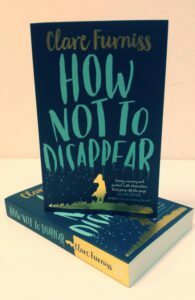 Clare Furniss | How Not To Disappear paperback is here! It won’t be in the shops until 14th July but copies of the new look How Not To Disappear paperback have arrived at the Simon and Schuster offices! Looking really stunning. There might just be a giveaway or two over the next month! Follow me on Twitter for details. And don’t forget, you can preorder from Waterstones here.